ConvertKit is an impressive email marketing software that provides all the tools and features you need to help you run a successful business. Perfect for bloggers, small businesses, and other creatives, ConvertKit is packed full of features to help ensure that the emails you send reach your subscribers and convert against your goals. ConvertKit was created in 2013 by entrepreneur Nathan Barry and is aimed at bloggers with growing audiences. Barry boasts that ConvertKit ‘has the power of Infusionsoft, but is easier to use than MailChimp’. And as the number of bloggers using this tool has grown dramatically over the last few years, it is clear that there must be some truth in this statement. 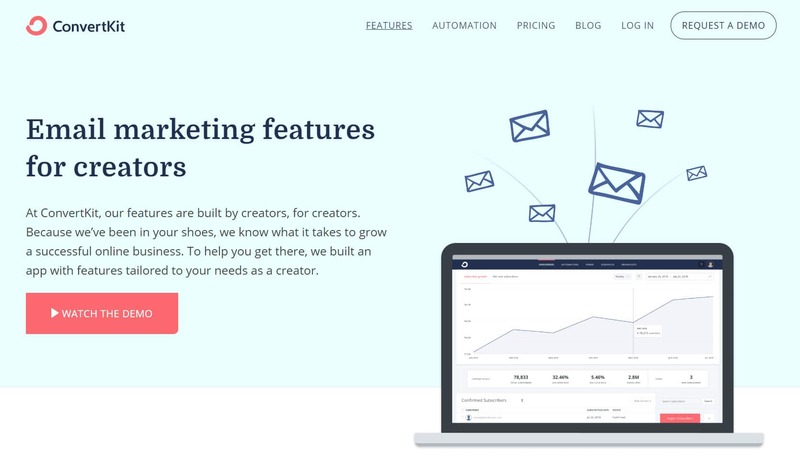 ConvertKit is a SaaS email marketing platform, built ‘for creators by creators’. Not only will it enable you to create email campaigns, it can also help you manage subscribers, add opt-in forms to your website, set up landing pages, and much more. User-Friendly Interface – All ConvertKit tools and features are available through its user-friendly interface. Within the dashboard you can create forms, write email sequences, access the visual automation builder, view analytics, and much more. Forms – ConvertKit will enable you to create beautiful and responsive forms within its visual form builder. Grow your email list by displaying pop-ups, slide-in forms, and more. Then easily add these forms to your WordPress website via the ConvertKit WordPress plugin. Landing Pages – Create landing pages to generate leads and subscribers. You can choose from a wide assortment of stylish and highly optimized landing page templates, which can then be fully customized within the ConvertKit visual form builder. Visual Form Builder – The visual form builder enables you to customize the form templates without touching a line of code. This tool gives you control over form settings and visuals, including display times, button colors, background images, font type and size, and much more. Email Campaigns – Known as Automated Sequences in the ConvertKit world, this platform will allow you to quickly and easily create a series of emails that can then be automatically sent out once triggered by an event. Personalization – ConvertKit will automatically personalize your emails based on the information provided from your mailing list. Send the right email to the right person at the right time, helping you to connect with your subscribers on a personal level and consequently boost conversions. Visual Automation Builder – A relatively new tool, the visual automation builder will enable you to visually create an automated funnel, based on your own custom rules. This will help to integrate your forms and email sequences, and ensure that well-timed and well-targeted content is sent to your subscribers. Manage Subscribers – One of ConvertKit’s key selling points is the customization options you have over how you manage your mailing list. Its customer-centric approach allows you to easily organize subscribers with tags and segments. By dividing your mailing list into groups and sub-groups, you can further target individuals with content directly relevant to their needs. Broadcasts – The Broadcasting feature lets you send one-off emails (or broadcasts) to your mailing list. This is an ideal tool if you need to send time-sensitive content, or you want to integrate your RSS feed to send your weekly blog posts. Integrations – ConvertKit integrates with over 80 apps and services, helping you to connect your mailing list with your other key business tools. 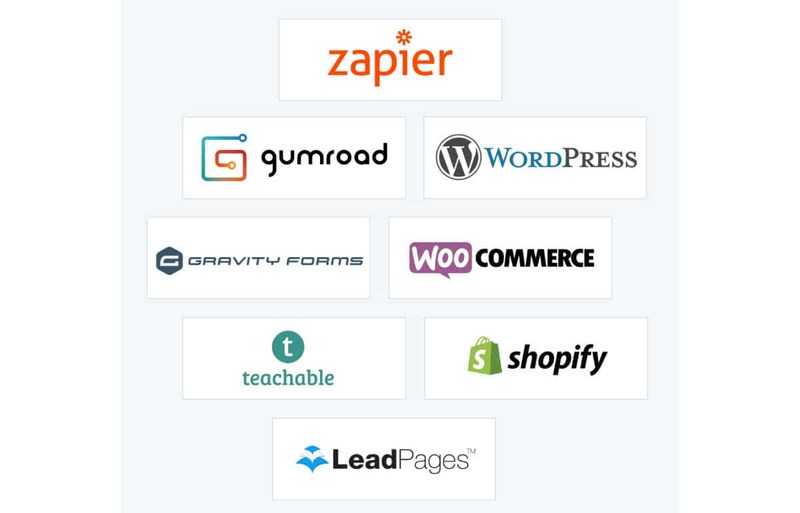 Integrations include Zapier, Shopify, Stripe, and many more. 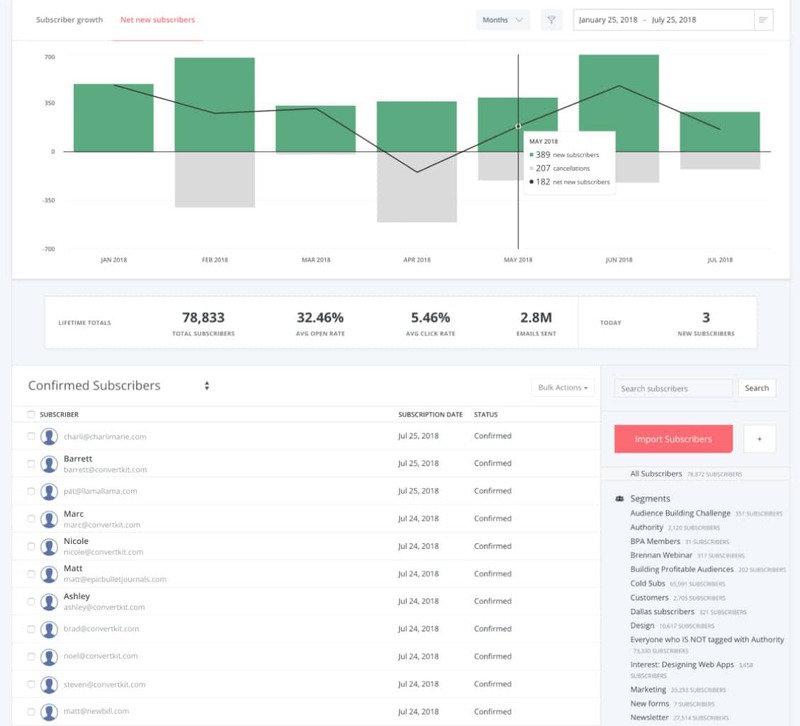 Analytics – ConvertKit enables you to track your growth by providing detailed reports on subscriber data and opt-in conversions. Support and Community – ConvertKit provides extensive support for its users. This includes a well-organized knowledge base, video tutorials embedded within your ConvertKit dashboard, live chat, ticketed support, a Facebook page, and Slack community. Works with Any Website – As ConvertKit is a stand-alone SaaS, you can create your opt-in forms on their platform, and then embed them into any HTML website. There is also a ConvertKit WordPress plugin to help users integrate easily integrate their ConvertKit accounts with WordPress websites. Migration – To make it easy to make the switch from another email service provider to ConvertKit, you can take advantage of the concierge migration service. 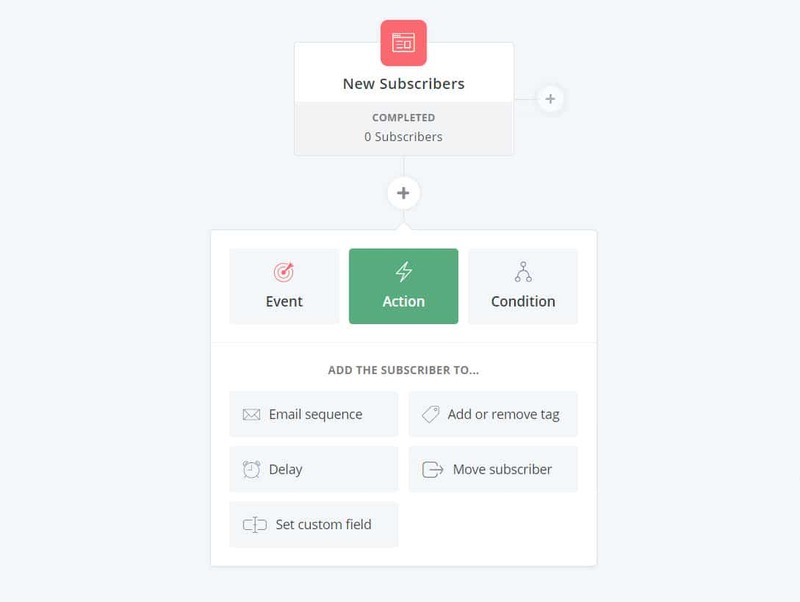 This is available to anyone with over 5,000 subscribers, and will ensure that every last subscriber and form is seamlessly moved across to ConvertKit. As already mentioned, ConvertKit provides an extremely intuitive interface. All tools and features can be accessed within the ConvertKit dashboard, and you can easily toggle between forms, sequences, automated funnels, and more. Forms, emails and automated funnels can all be created directly within the dashboard using the built-for-purpose editors. These editors ensure that not only you do you not need to touch a line of code, but you also have a range of setting configurations and customization options to select from, giving you control over the appearance and actions of your emails and forms. Importantly, ConvertKit has also embedded a number of tutorial videos throughout the user dashboard. This is useful for beginners, as the videos walk you through how to get started using the different ConvertKit tools, as well as giving top tips on how to create emails and forms that convert. A live chat feature is also available within the dashboard, so the ConvertKit customer success team are constantly on hand to answer any questions or queries. A key aspect of the ConvertKit platform is the focus on lead generation. By opting to use ConvertKit, you have immediate access to its opt-in form and landing page templates, as well as the visual form builder. These forms and landing pages can easily be embedded in your website, and will help to grow your mailing list. Visual Form Builder – Create a form or landing page to suit the needs of your business. Customize forms and templates within the visual builder, configure settings, and check your analytics. Form Types – ConvertKit offers three different form types that you can display on your website – in-line forms, slide-in forms, and popups. 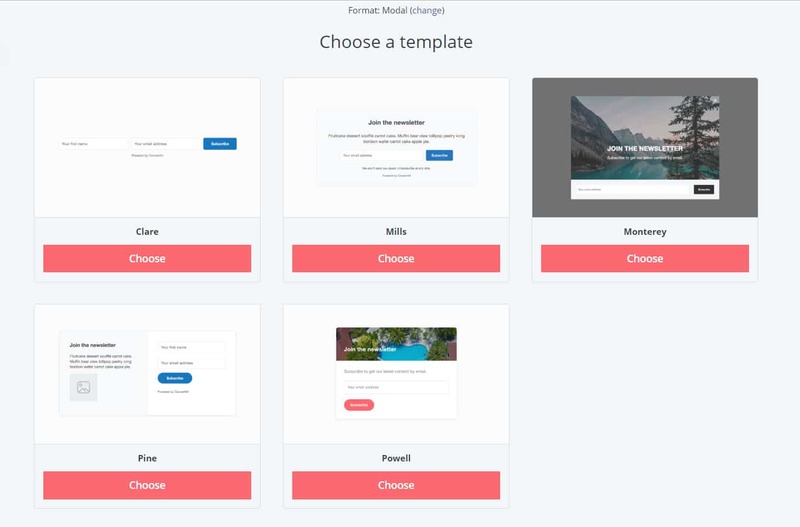 Form Templates – There are a smattering of form templates to select from, all that can then be customized within the visual builder to ensure they reflect your brand. Landing Page Templates – ConvertKit provides a good variety of landing page templates, all that display impressive visuals. You can also add SEO metadata to a landing page within the visual builder, helping the page to rank in the search engines and reach your target audience. Custom Fields – Within the visual builder, you can add custom fields to your landing pages and forms to help you collect the necessary customer information that is relevant to your business. Lead Magnets – You can set a lead magnet to deliver when a user signs up to a form. Forms Placement – Forms can be placed around your website at your discretion. They can be embedded in content or widget areas using shortcode or added as a pop-up or slide-in to specific pages or posts. Form Triggers – Within the visual builder you can configure trigger settings, so a form appears after a certain trigger. These trigger options include displaying a form after a visitor has spent a certain time amount of time on your site or scrolled down a certain percentage of a page. You can also select to show a form as a visitor makes to exit your site. Responsive – All forms and landing pages are 100% responsive on any device. This helps to provide a user-friendly experience for your visitors, whilst growing your mailing list. Unlimited – You can create and display an unlimited number of forms and landing pages. Your forms and landing pages can be added to your WordPress website using the ConvertKit WordPress plugin. 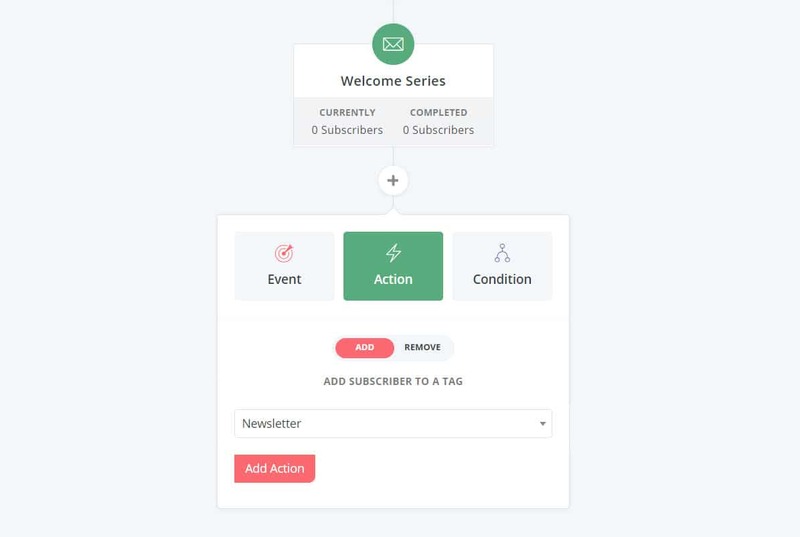 As you begin to generate leads through your forms and landing pages, you can use the ConvertKit tags and segments feature to organize your subscribers in a way that works for your business. Tags – Tags are a way of grouping the recipients in your mailing list, helping you to organize people according to categories of your choosing. Segments – Use segments to help you organize the tags you have created. Forms – Subscribers will also be grouped depending on the form they used to subscribe to your mailing list. When you create your emails and email sequences, you can then select to send these to subscribers on your list who are grouped in a particular tag or sequence. This is an effective way to easily organize your mailing list, and ensure that your subscribers receive emails that are relevant to their interests and needs. Drag-and-Drop Email Builder – Create your email sequence within the drag-and-drop email builder. Here you can write emails, arrange the order of emails being sent, customize target audience settings, access analytical reports, and much more. 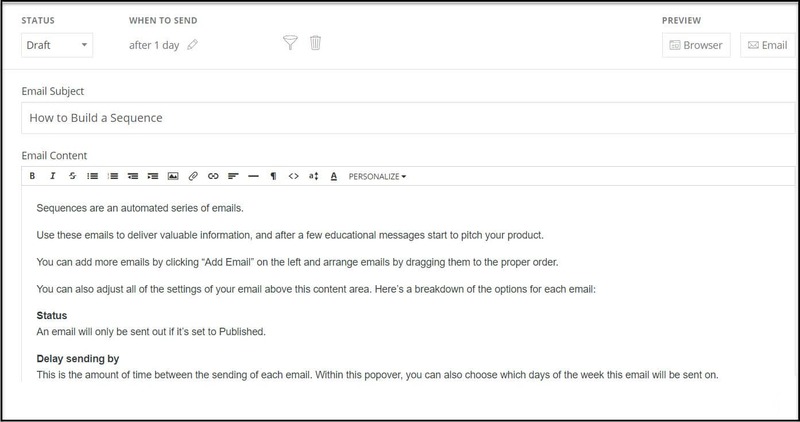 Email Editor – Write emails within the editor. Then format your text, upload images, insert links, and more. Personalization – Give your emails the personal touch by adding subscribers’ names. Exclude Subscribers – Choose to exclude certain subscribers on your list, helping send the right sequences to the right people. Unlimited Emails – Each sequence can contain an unlimited amount of emails. Reports – ConvertKit provides reports on how your email sequences are performing. Stats include the average open rate and click-through rate. Good examples of sequences include a welcome sequence for those who have recently signed up to your mailing list, which could share popular content and promotions from your site, or a thank you series to new buyers, providing discount codes for future purchases and related products of interest. The visual automation builder will enable you to create powerfully automated funnels. 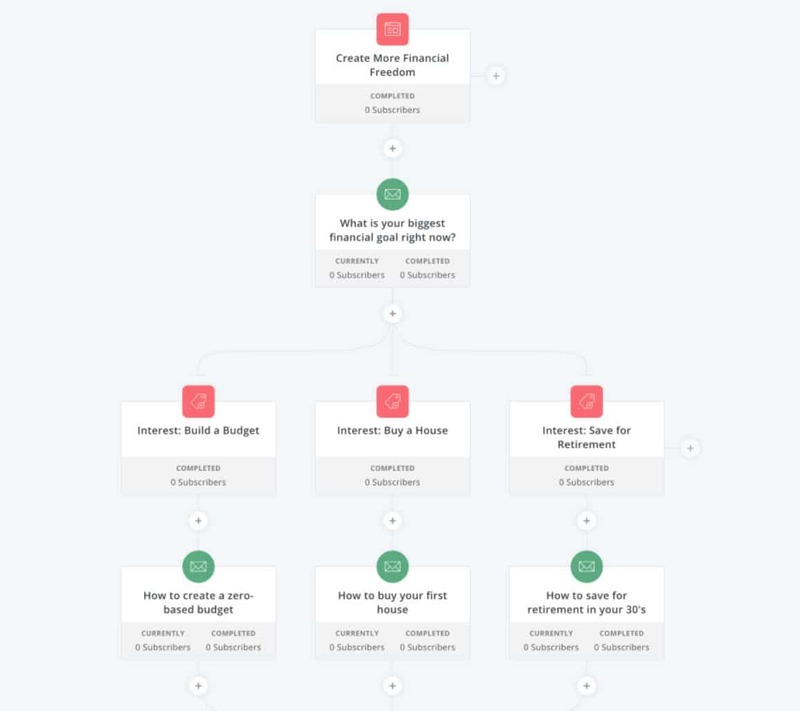 These funnels reflect a customer’s journey, mapping out the path each customer takes. Importantly, the visual funnels help you to see exactly where a customer is within the funnel, and where they are going next. Therefore, you can monitor how successfully your content is engaging with your audience, and if you are achieving your email marketing goals. Event – An event will trigger an automatic action, which will move a subscriber to the next step of your automation. An event could include a customer completing a form or purchasing a product, or being added to a tag. Action – An action will follow an event. Actions could include a subscriber receiving an email sequence, being added or removed from a tag, or being moved to another automation series, to name a few options. Condition – A condition checks that a subscriber matches the criteria when they reach certain points of a funnel. (For example, a subscriber has a particular tag, or other custom field attribute). The visual aspect of the automation builder is a clear benefit of using this tool. You can clearly see how your forms, tags, and email sequences integrate, and how your customers are traveling through the funnels you have created. Consequently, you can ensure that you are targeting the right people with the right content. If you want to send one-off emails to your subscribers, you can do so by creating a broadcast. A broadcast is a stand-alone email, that you may want to send to a specific group, or your whole mailing list. A broadcast can be created and sent within the Broadcast builder, which you will find in your ConvertKit dashboard. Recipients – Select recipients based on pre-existing segments and tags, subscribers locations, forms users have responded too, products customers have purchased, or other criteria. Editor – Write your email content within the broadcaster editor. Add links, upload images, insert files, and configure the text. You can also personalize the opening sentence by instructing ConvertKit to automatically add recipients names. A/B Testing – You can split test the title of your email, to see which subject line best appeals to your audience. 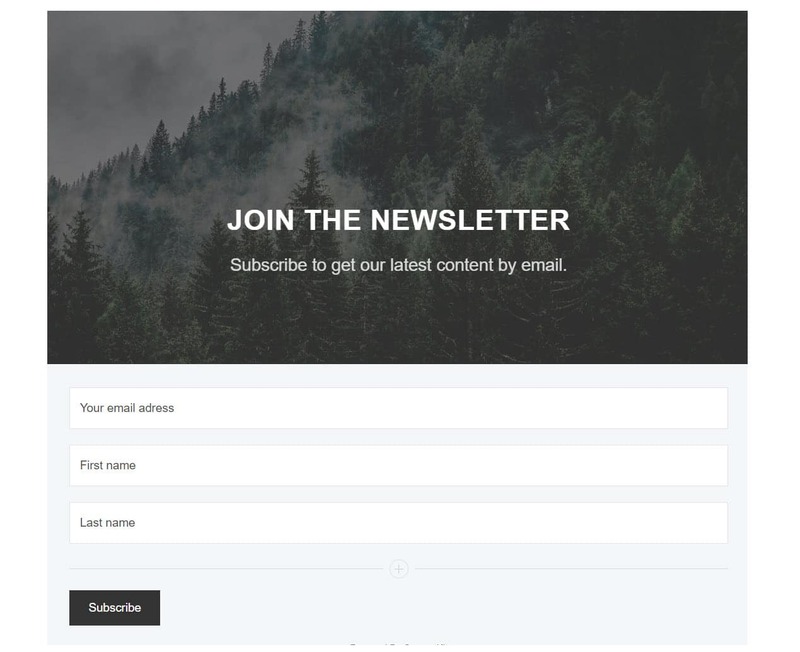 ConvertKit will send the two variations of the email to 15% of your subscribers. After four hours, the email that gets the highest open rate will then be sent to the other 70% of recipients. Schedule – Choose whether to send the broadcast immediately, or select a future time and date. Integrating ConvertKit with your website, and the numerous other tools, apps, and services that you use, is crucial. Not only will integrations save you time and effort, they will also help to coordinate your business, understand your customers, and ultimately increase your revenue. ConvertKit doesn’t sync with everything, so if there is a particular integration you need, make sure you check out the extensive list of ConvertKit integrations before committing to this platform. Knowledge Base – The ConvertKit knowledge base is well laid out, with easily accessible information which has been organized into various categories. You can also use the search function to quickly find any specific topics or articles. Video tutorials are also embedded within the ConvertKit dashboard to give helpful beginner tips on how to get started. Workshops – The ConvertKit customer success team run weekly workshops so users can learn how to get the most out of this platform. Although the videos are pre-recorded, a member of the support team is on hand during these workshops to answer any questions that may arise. Live Chat – The live chat feature is available within your ConvertKit dashboard and, from my experience of using it, this is a very helpful tool. A member of the ConvertKit customer success team will quickly answer your questions and help walk you through the solutions to any problems that you might have. Support Tickets – If you would rather, you can open a ticket with ConvertKit and a member of the customer success team will email you directly. Facebook Page – ConvertKit runs two Facebook groups – one aimed at those new to ConvertKit and another to offer ongoing support to more experienced email marketers. These both offer tips and tricks for email marketing on the ConvertKit platform, as well as a space for users to ask questions and share their successes. Slack Community – Customers can join the ConvertKit Slack community where they can connect with other users and learn more about blogging and email marketing through shared experiences. If you are moving from another email marketing provider and are joining ConvertKit on the $99 a month plan, with over 5,000 subscribers, then you can take advantage of the concierge migration service that ConvertKit offers. The concierge migration service will take care of all your migration needs, moving all email sequences, subscribers, forms, landing pages, and more. This service will not just save you time and money, but it will also ensure that you don’t lose any subscriber information, or upset the email campaigns that you already have running. As you can see, ConvertKit provides a wide assortment of impressive and useful features and tools, enabling you to quickly and easily generate leads, send email campaigns, and connect with your mailing list on a personal level. This, in turn, will lead to a higher number of visitors returning to your site, which will ultimately increase conversions and revenue. We will now take a look at the user experience that ConvertKit provides, and if creating a form, an email sequence, and an automated funnel is as straightforward as we are lead to believe. ConvertKit provides a 14 day free trial so users can try before they buy. Therefore, to set up a ConvertKit account, simply select Try it for Free. You will then be asked for some basic information, including your email address and phone number. Once completed, you will find yourself in your new ConvertKit dashboard. ConvertKit displays a friendly welcome screen to new subscribers. There is a checklist on the left-hand side of the screen to help you to quickly get started and set up your account. There is also a demo video to give you further information on what you can do on the ConvertKit platform. If you want to add an opt-in form to your website, then you will need to begin by creating your form in the visual builder. To do so, select Forms > New Forms from the top menu. You will see here again ConvertKit displays a helpful video, guiding you through the process of creating a form. Inline Form – Embed forms within your website content or halfway through a blog article. Modal – Display an opt-in form as a popup on your site. Slide-In – Slide your opt-in form discretely into the bottom of your users’ screen. For this article, we have selected Modal. Next, you will need to select a template to use for your opt-in form. The number of templates that ConvertKit offer is not extensive. However, that said, there are enough that you will be able to find an appropriate opt-in form from the templates that are available. Once you have decided on your template click on Choose. Your new template will now open within the ConvertKit visual form builder. The visual editor is an extremely intuitive tool that will enable you to quickly edit your form template without needing to touch a line of code. You can customize each design element by simply clicking directly on it, and then altering the settings in the Settings menu that appears on the right-hand side of the page. Headings and Subheadings – Rewrite the text, change the font size and color, add a URL link, and more. Form Fields – Change field text, alter the font and border colors, make a field ‘required’, and add multiple new fields, to name a few options. Button – Edit the text on the button, change the button color, and alter the font color and weight. Form Styles – By clicking on the Styles icon in the right-hand side menu, you can also upload a new background image, change the header and content backgrounds, or add your own custom CSS. The ConvertKit visual editor does have its limitations. You can’t add new elements to the form templates, or resize or reposition elements in a drag-and-drop style, as many builder tools allow. That said, there are enough customization settings to ensure that you can create a form that reflects your brand and opt-in needs. Conversion Action – Select what happens when a user subscribes to a form. You can write and display a ‘success message’, or redirect a user to another page. Display Trigger – Choose when to display your opt-in form to visitors on your site. 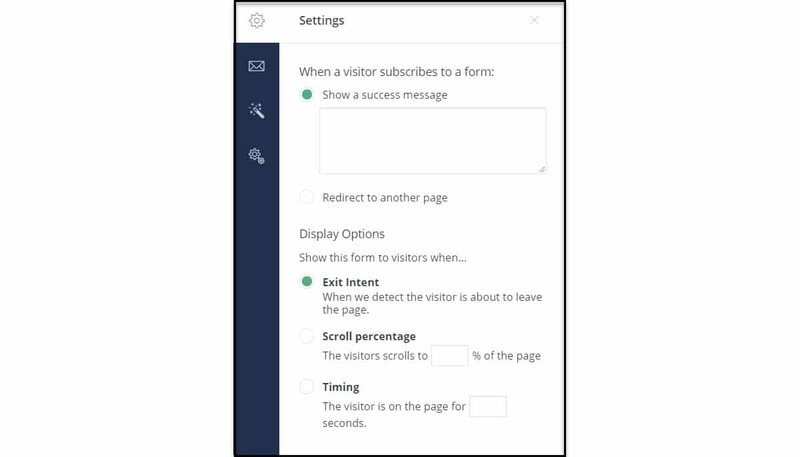 You can choose to trigger the form after a visitor has spent a set amount of time on your site, after they have scrolled a percentage of the way down a page, or as a visitor goes to leave your site (exit intent). Devices – Opt to display the opt-in form on mobile or desktop, or on all devices. Cookies – Choose how often a visitor should be exposed to an opt-in form. In the interests of user experience, displaying a form every 15 days to a user is recommended. Returning Subscribers – Select what to show to your returning visitors who have already subscribed to your mailing list. By default, ConvertKit will continue to show the form, but you can choose to hide it or write your own custom message. Thank You Page – Send subscribers to a predefined thank you page. Invisible reCAPTCHA – Opt to enable reCAPTCHA on your opt-in forms, and display the badge in the bottom right-hand corner of your website. You can also set up an incentive email to be sent to a subscriber once they have signed up to your mailing list. Select the Email icon from the right-hand side menu and then select Edit Email Contents to write the body of your welcome email. You have now successfully created your form. The last step in this process is to embed your form into your WordPress website. By selecting Embed from the right-hand side of the top menu bar, you will find the HTML embed code as well as the WordPress shortcode for your form. If your website runs on WordPress, the easiest way to integrate your website and ConvertKit account is to install the ConvertKit plugin. To do so open your WordPress dashboard, select Plugins > Add New and then search ConvertKit within the plugin search function. The ConvertKit plugin will now be retrieved, and you will need to click on Install > Activate. You will now need to connect your website and ConvertKit account. Select Settings > ConvertKit from your WordPress menu. Then click on the link labeled Get your ConvertKit API Key/Secret to integrate the two solutions. Now scroll down the page and next to Default Form select the form you want to display on your website. If there are no forms to choose from, click on Refresh Forms. Once you have selected the appropriate form, click on Save Changes at the bottom of the page. If you have created an inline form, then you can add the form shortcode into the WordPress editor on any page or post. Once set up, open your website on the front end to check how your form looks and that it is working. So now we know how to set up an opt-in form on your WordPress website. And once it has gone live, you should hopefully soon begin to accumulate new subscribers to your mailing list. So now let’s look at how to set up an email campaign to help you connect with these new subscribers. Managing your subscribers is easy with ConvertKit. Simply open your ConvertKit dashboard and select Subscriber from the top menu bar. Here you will find some basic reports on the number of new subscribers you have received, as well as a number of options over how to organize your mailing list. Add Subscribers – As well as the subscribers you receive through your forms, you can also import subscribers, or add them manually. Create a Tag – ConvertKit allows you to create your own custom tags, allowing you to group your subscribers in anyway you please. For example, you could create a New York Newsletter tag, and then add this tag to any subscribers that live in New York. You could then target subscribers in this tag with a weekly New York newsletter. Create a Segment – A segment organizes tags and other sources. Therefore, when you create a segment, you have the option of adding numerous groups to it (based on tags, forms, locations, and more). Subscribers – Within your Confirmed Subscriber list, you can click directly on a subscriber to view their details and add them to tags. You can also use the Bulk Action tab to add tags to more than one subscriber at a time. Once you have organized your mailing list, created new tags, and grouped your subscribers accordingly, it is now time to set up your first sequence. When using ConvertKit, you will come to know automated email campaigns as Sequences. A sequence is a series of automated emails, that are sent to members of your email list. To set up a new sequence, select Sequences > New Sequence from the top menu. Before you start the creation process, you can view a useful tutorial video from ConvertKit on how to get the most out of the Sequences tool. Firstly, you will need to give your Sequence a name. You will then find yourself inside the visual email builder, where you can create your sequence of emails. There is currently no limit to how many emails you add to your sequence, so a sequence can contain as little as one email up to as many as required. Best practice is to start by writing the bodies of each email, and giving them an attention-grabbing subject title. You can add further emails by clicking on the Add Email button on the left-hand side of the screen. Here you can also drag and drop the emails to rearrange their order. At the top of the editor, you will find a When to Send section. Here you can select the time frame for when to send each of your emails in the sequence. You can choose from immediately, to picking a set day, or a certain number of hours or days after the subscriber has opted in. By default the timings for each consecutive email will be based on the email sent before. Click on Settings, which you will find in the right-hand corner of the menu bar. Here you will find a number of setting options related to your email sequence. These include further timeframe settings as well as the option of duplicating or deleting the sequence. Forms – Exclude subscribers who joined via a particular form. Sequences – You can exclude subscribers who are already receiving emails from a different sequence. Tags – Exclude users who have been grouped in particular tags. Segments – As with tags, you can exclude a whole segment of users. This feature helps ensure your email sequences are relevant to individual subscribers, helping to increase the open and click-through rates of your emails. Once you are happy with your emails – content and sequence settings – you should Preview and then Publish the sequence. You can monitor the success of your live campaigns within the email builder. Simply click on Reports, which can be found in the right-hand corner of the menu bar. Here you will be able to track the success of your campaign, and use these insights to inform further sequences. The visual automation builder will enable you to create automated funnels that will help to lead customers to your desired outcome. This tool brings together all the features previously mentioned (opt-in forms, subscriber tags and segments, and email sequences) and helps them run in an automated workflow. To get started with automations, select Automations > New Automation from the top menu. Then, once in the visual automation builder, select Create Automation. You then need to select an event. Here I have clicked on Joins Form, and then chosen a previously designed form. You can also opt to create a new form within the visual automation builder if you would rather. Next you need to select the action that will occur once a subscriber has joined a form. Here I have clicked on Email Sequence and selected the Welcome Series email sequence, so subscribers will be sent a welcome campaign. Again, if you haven’t already set up a particular email sequence, you can do it here within the visual automation builder. The last step in this short automation funnel is to add the new subscribers to a tag. I am going to add them to a Newsletter tab that I previously created, so in the future these users will receive any newsletters sent out. Again click on Action and then select Add or Remove Tag. Then click on the appropriate tag or create a new tag. We have now created a basic automated funnel. To make it go live, simply toggle the button at the top right-hand corner of the page from Paused to Live. ConvertKit allows you to create as many automated funnels as you need, containing unlimited amounts of events and actions, ensuring that all your email marketing needs are catered for. Evidently, ConvertKit is a very intuitive tool. Quick and easy to set up, you can immediately begin writing emails to your customers, and creating automated email marketing funnels, helping you to connect with your audience on a personal level. Access to All the ConvertKit Tools and Features (apart from concierge migration which is only available to top tier members). For over 7, 500 subscribers, ConvertKit will increase the cost accordingly. And for those paying annually, ConvertKit will give you twelve months for the price of ten. Don’t forget there is also a 14-day free trial for you to take advantage of. ConvertKit is an impressive tool that will help you grow and manage your mailing list, create well-timed and targeted email sequences, and automate your email marketing processes. 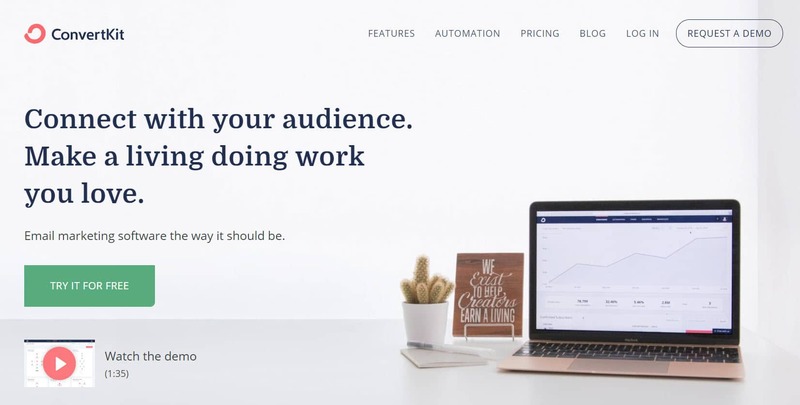 Using an email marketing platform like ConvertKit will ensure you connect with your target audience, bring visitors back to your site, and help your business convert against its goals. So are you ready to try ConvertKit? Thank you for detailed review. I personally use the ConvertKit in pairing with Postcards https://designmodo.com/postcards/ . I have changed the MailChimp to ConvertKit a few months ago, and I don’t regret this step.